Acne is painful and irritating skin trouble. Acne doesn’t only affect your face, but it can develop in any area of your body. Your back is a common problem region. Back acne ruins your appearance and affects your self-confidence too. Are you suffering from back acne? Are you searching for the fast ways to get rid of it once and for all? In today’s article, you will discover top 19 worth-trying tips on how to get rid of back acne fast at home. 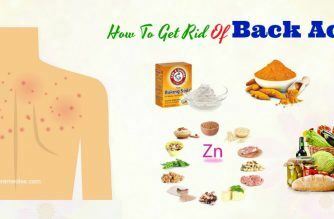 Keep reading this article to know exactly what you should do to get rid of your back acne problem. Low-Glycemic Diets: Some recent studies show that a low-glycemic diet can be helpful in preventing and improving acne. As per a study in 2007, following a high-protein, low-glycemic diet for twelve weeks improved acne and led to weight loss too. Foods items with low glycemic index include oat bran & rolled oats, brown rice, whole wheat, peanuts, nuts & raisins, tomatoes, carrots, mushroom, oranges, broccoli, etc. Vitamin A, D & E Rich Foods: When applied topically, vitamin A or retinol can combat acne efficiently. Individuals who suffered from acne often had low vitamin D levels. Vitamin C helps to prevent comedones from forming and kill bacteria causing acne. Carrots, egg yolks, sweet potato, tuna, salmon, whole raw milk, spinach, olive oil, avocado and tomatoes are some of the best foods rich in vitamins A, D & E.
Foods Rich In Zinc: Zinc is beneficial for destroying bacteria contributing to acne. According to several studies, people who were having acne (both women and men) had remarkably low zinc levels in their bodies. Zinc lowered acne inflammation significantly when consumed orally. Food items rich in zinc include chicken, cashew, sesame seeds, pumpkin seeds, mushrooms, spinach, yogurt, chickpeas, etc. Antioxidant Rich Foods: One of the leading causes of acne is oxidative stress. Low antioxidant levels can cause oxidative stress. Thus, eat foods high in antioxidants to avoid acne. You can find the source of antioxidants in foods such as cilantro, green tea, tomatoes, dark chocolate, berries, raisins, broccoli, and artichokes. Omega-3 Fatty Acids: According to a study, omega-3s are anti-inflammatory, and people who included these fatty acids in their diet decreased levels of acne severity. Omega-3 fatty acids are mainly found in eggs, fish such as salmon, herring, mackerel, sardine, flaxseeds, caviar, oyster, cod liver oil, walnuts, Chia seeds, and soybeans. Here is the full list of simple-but-effective tips on how to get rid of back acne fast once and for all. Try them regularly to achieve the desired results. A balanced, healthy diet is highly beneficial for treating back acne and other beauty and health issues. Consume plenty of water to remove bacteria and toxins from the body. Eat fresh vegetables and fruits, especially leafy greens and whole grains. Include wheatgrass, lime, and aloe vera which play a crucial part to heal the back acne. Get plenty of rest to regulate hormones and inhibit excessive oil secretion. Eat garlic to strengthen your immunity. It helps to combat the acne, its breakouts & pain. Avoid stress to inhibit hormonal fluctuations causing acne. You can manage your stress levels by doing some regular exercises, yoga, meditation, deep breathing, etc. Avoid spicy, salty, sugary, greasy, fatty, and processed foods. Also, avoid alcohol and caffeine. Wearing dirty clothes may transfer dirt and oil to your skin, leading to back acne. Thus, always wear clean clothes. Plus, ensure your clothes are loose-fitting, as that allows the skin to breathe and does not trap impurities and sweat against your skin. Along with that, it is best to wear clothing made of breathable materials. Avoid wearing synthetic fabrics because they can trap sweat that can lead to breakouts. If your hair is long, it can transfer oil and dirt to your back, shoulders, and neck. To lessen this trouble, wash your hair often. It is also crucial to wash your hair regularly if you often use hair products since they can clog your pores. After using shampoo and conditioner, try washing your back carefully. Exfoliation is useful for removing back acne. You can use a gentle body scrub or a sponge and then rub it once or twice per week in circular motions to eliminate dirt and dead skin cells stuck in your follicles. Alternatively, you can exfoliate your back by using a homemade scrub. To make it, you squeeze a grapefruit in one bowl and add ½ cup each of white sugar and coarse salt to it. Mix these things gently to create a paste. Start applying the paste over your back and wait for a while. After that, use a loofah or sponge to rid your back of the remainder. It is best to cleanse your skin well in the shower daily. To prevent the dead skin cells from forming and blocking the pores, use a body wash having ingredients such as lactic acid, glycolic acid, and salicylic acid. Using a particular shower gel containing alpha or beta hydroxy acid may help decrease back acne effectively. Bacteria and dead skin cells collect quickly on sheets. Besides, pets sleeping on the bed will be tracking in dirt. It is recommended to remove the sheets and change or wash them once to twice every week. Always wash comforters, blankets, and other bedclothes frequently. Once sweat gets accumulated on your skin, this will cause acne and breakouts. Ensure that you take a shower immediately after a workout to inhibit acne from appearing on the back. If not, it’ll result in serious skin-related issues. Using a rough cloth to wipe your skin right after the shower can further worsen the situation. 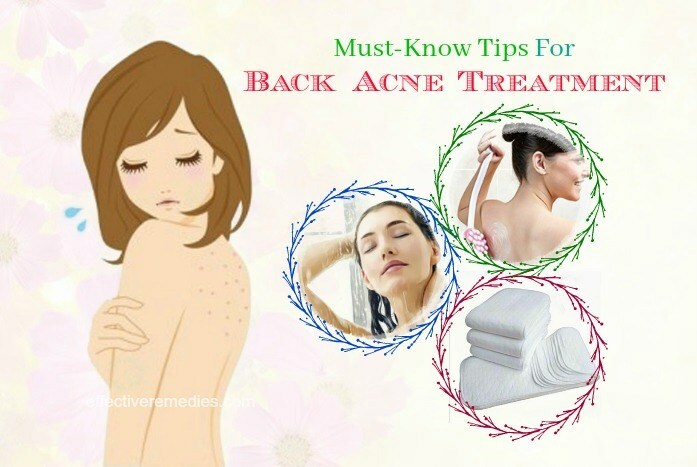 You need to follow proper care to prevent the back acne. After the bath, remove the excess water gently with a soft cloth. Always make sure that you’re gentle on your skin. Using body lotions not only keeps the skin moisturized and hydrated but also treats your back acne. Not dehydrating the skin well will cause excess oil secretion that will lead to acne and breakouts. Thus, apply body lotions on a daily basis to avoid the problem of back acne. 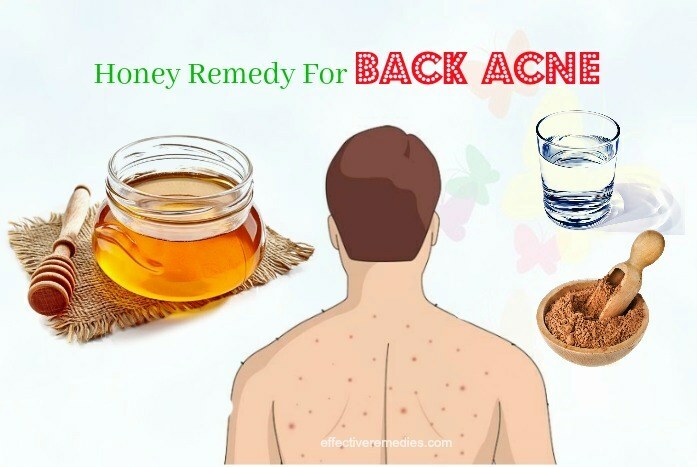 To prevent and decrease the occurrence of acne on your back, here are a few of the safest and best home remedies. Whether it is applied topically or taken orally, green tea is perfect for dealing with acne. The compound catechins found in green tea contain antibacterial abilities that help kill bacteria causing acne. The anti-inflammatory nature of green tea helps to soothe the inflammation and redness caused by acne. Firstly, add the green tea to the hot water, steep for five minutes and strain. Immerse the cotton pad in it and after the mixture cools down a bit. Gently spread it on your back and wash it off after around 15 minutes with water. You can also consume green tea frequently. For quick relief, try this treatment twice to thrice daily. Precautions: Use decaffeinated green tea to avoid side effects such as irritability, insomnia, loss of appetite, and dizziness. Before beginning green tea treatments, pregnant women should consult a doctor. Baking soda is anti-fungal and contains antibacterial and antiseptic abilities. It’s a universally used natural ingredient to treat acne, including back acne. 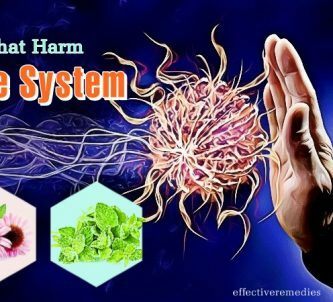 It is also helpful in restoring the normal pH of the skin, this relieving the symptoms of acne due to its alkaline nature. Moreover, it can help to exfoliate the skin, removing the accumulated sebum and dead cells in the pores. Add a little water to the baking soda to create a thick paste. Start applying the paste to your back and let it dry on your skin for around 20 minutes. Afterward, wash it off and gently scrub it off the skin. Follow the remedy twice to thrice every day. Precaution: Before using baking soda, conduct a patch test. It may cause itching or stinging sensations. If this occurs, wash it off instantly. Honey is beneficial for keeping the acne-affected area calm and hydrated. It is also full of antioxidant and antibacterial characteristics, which can decrease scarring left by back acne. It further decreases acne symptoms and inhibits infection. You can even inhibit breakouts by adding to honey to your skin care regime. Dab some Manuka or raw honey on your affected region. Wait for 10-15 minutes and use warm water to rinse the area. Repeat 2 to 3 times a day. Make a paste with the cinnamon powder and honey. Begin applying the paste to your back and wash off after ten minutes with warm water. Follow this remedy once a day. Precautions: People who are allergic to honey bees and pollen shouldn’t use honey to remove acne. Perform a patch test to ensure you are not allergic to honey before using it. Turmeric helps to murder P. acnes bacteria that contribute to acne, as it contains an antibacterial property. In addition to this, this ingredient owns an anti-inflammatory property that is ideal for calming pain and inflammation. It further aids in balancing the pH level of the skin that in turn keeps it free from breakouts. Just combine the turmeric powder with some sesame oil to create a paste. Later dab the paste on your affected area and rinse it off after about 60 minutes. It’s best to use this effective remedy once or twice every day for a couple of days. Make turmeric milk by mixing the turmeric powder in the warm milk. Then, drink this turmeric milk twice every day to reduce inflammation and pain. Precautions: People who suffer from kidney stones or gall bladder problems should avoid turmeric consumption. Upon topical application or consumption of this yellow spice, if you develop rashes, avoid using it further. Lemon helps to eliminate back acne fast because it is abundant in L-ascorbic acid. This acid is also effective for banishing dead skin cells and unclogging pores. Apart from that, it holds antibacterial properties that help destroy acne-producing bacteria. Mix the rose water and lemon juice in equal amounts. Apply it to your affected skin by using a cotton ball. After 20-25 minutes, rinse the skin with cool water. Use this remedy twice daily for best results. Precautions: Topical application of lemon isn’t recommended for people having highly sensitive skin. 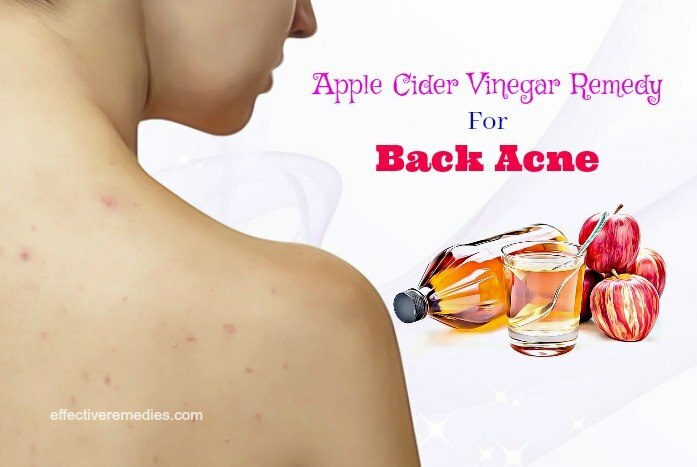 Apple cider vinegar (ACV) is another efficient remedy for the treatment of back acne. It holds anti-inflammatory and antibacterial abilities, which work well to prevent inflammation and the growth of bacteria responsible for skin breakouts. Dilute the apple cider vinegar with water before applying it to the affected parts of your back. Rinse the area with lukewarm water after 10 minutes. Finally, apply a light moisturizer. Reapply it about thrice a day until the back acne is healed completely. Precautions: Before applying ACV, dilute it to avoid irritation. Also, avoid applying it to very dry areas, open wounds, & too near to eyes. After each application, don’t forget to wash your skin carefully. Tea tree oil can help to fight against back acne since it is chock-full of antiseptic and anti-inflammatory qualities. 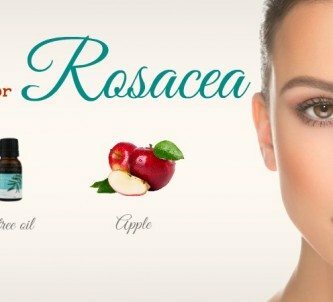 This oil can also help to dry out the acne fast when used topically. Along with that, it can soothe redness and inflammation. Put the prepared tea tree oil onto the cotton ball and gently dab it on your back. Rinse the application by using lukewarm water after 15 to 20 minutes. Reuse this remedy once every day. Precautions: Undiluted tea tree oil is not suggested to people who have sensitive skin. Before us, dilute one part of tea tree oil with three parts of water. Limiting the use of oil-based skin care products: Try not to use sunscreens, cosmetics, moisturizers & any other oily products on the back, as they can cause back acne flare-ups. Instead, search for a skin care product which is labeled non-comedogenic. This means that they do not promote blackheads. Avoiding certain medications: A few drugs including lithium and androgens (male hormones) can increase your risks of developing acne. Consult a doctor about possible alternative methods if you’re taking any of these medications. Removing pressure on your back: Try not wearing sports equipment such as shoulder pads or carrying a backpack for a while. Friction and prolonged pressure from these objects on the back can cause back acne breakouts. Applying OTC zinc creams and lotions may help decrease acne breakouts. Avoid pressure on the back to boost the healing procedure. Don’t make the mistake of picking or squeezing back acne lesions. Avoid excessive drinking and smoking as it may cause acne. Avoid foods such as ice cream, chocolates, and cheese because these can aggravate acne. Instead of sleeping on your back, sleep on your sides and keep bedding clean. 1. How Long Will You Have Acne? Untreated acne often lasts for around five years before starting to settle. But it can take lots of years for this condition to stop recurring in some cases. 2. What Are The Best Soap For Treating Back Acne? Soaps consisting of anti-acne agents such as salicylic acid, benzoyl peroxide, and tea tree oil are often used to deal with acne. Such soaps include Dermadew, Neutrogena, and Sebamed. Any of the above cures can also help without resulting in serious side effects. 3. What Causes Acne Outbreaks On Your Back? There are a few things that can cause acne on your back, including hormones, bacteria from workout equipment, workouts, and clogged pores. 4. Is It Common To Suffer From Back Acne? The most common areas to have acne are on your face, neck, back, and shoulders. If the acne appears on your back, you aren’t alone, millions of people in the world do. 5. Do Foods Cause Acne? There are a few foods that can lead to acne on the back. Some of them are unhealthy fats, dairy, and chocolate. Have you used any of these ways for treating the back acne problem once and for all? 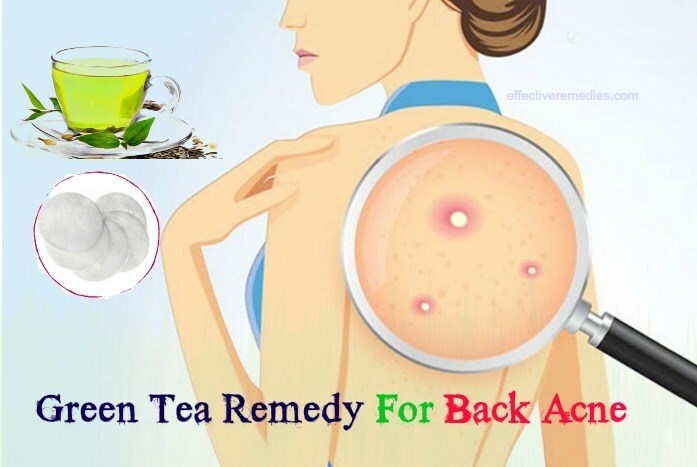 Do you know of any other ways on how to get rid of back acne fast at home? Please, share your thoughts or experience with us! All of the contents provided in this article are for informational & educational purposes. We recommend you consult a healthcare professional to determine which method is appropriate for you. To know more must-know tips & tricks for other health and beauty issues, visit our How To page.